New York: Algonquin Publishing Company, (1928). ￥2,000 (税込み) 18.6 x 14.6 cm. 38, (3) pp., with many illustrations in color. Original pictorial boards, spine defective, color pictorial endpapers, signed by the author on title page. 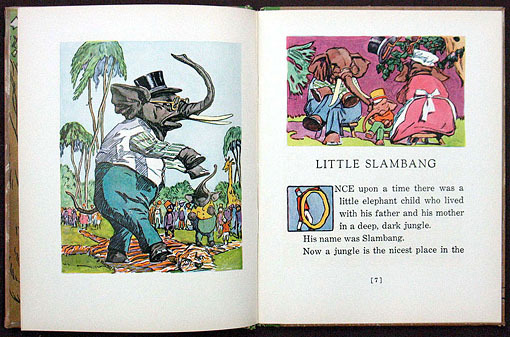 A wonderful story about an elephant named Slambang and his adventures. The characters are dipicted in human terms with wonderful color illustrations.